Heat oven to 350°F. Spray 10-inch angel food (tube) cake pan generously with cooking spray, and set it on cookie sheet. In 1-quart saucepan or 6-inch skillet, brown 1/2 cup butter by melting over medium heat until it begins to foam, then beat constantly with whisk until solid bits in butter turn dark brown and smell fragrant like toffee. Remove from heat, and pour butter into heatproof dish to cool. In small bowl, mix bourbon and cherries; allow to soak about 10 minutes. In medium bowl, beat sour cream, cooled browned butter and eggs with whisk. Beat bourbon-soaked cherries into sour cream mixture with whisk. In large bowl, place cake mix and pecans. Fold in sour cream mixture until just combined. Scrape batter into pan. In small bowl, mix Streusel ingredients. Pinch butter into mixture until sandy and clumps form when pinched. 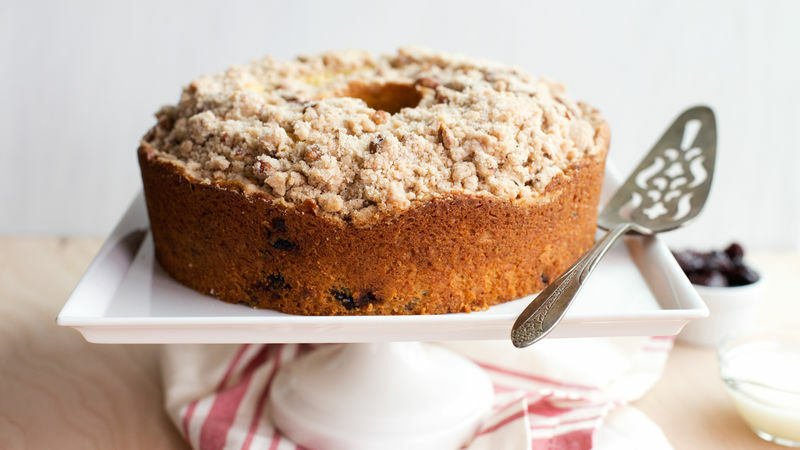 Sprinkle streusel over batter in pan. Bake 45 to 50 minutes or until toothpick inserted in center of cake comes out clean. Cool 20 minutes. Loosen cake from pan using sharp, thin knife; remove from pan. Cool completely before serving with or without glaze (see tip for glaze). Soaking cherries in bourbon makes the dried cherries plump with a bit of bourbon flavor. If desired, make a quick glaze. In small bowl, beat 1 tablespoon sour cream, 1 tablespoon milk and 1/2 cup powdered sugar with whisk until smooth; drizzle over cooled cake.